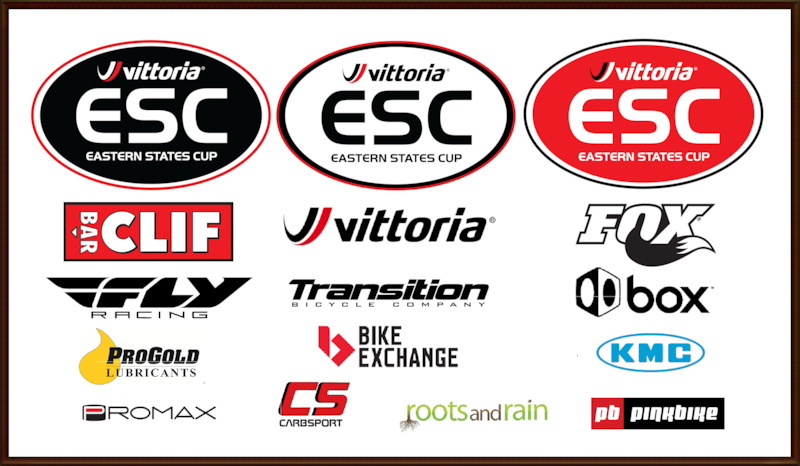 The Vittoria Eastern States Cup Enduro Series headed north this past weekend for round two of the ten-race series. 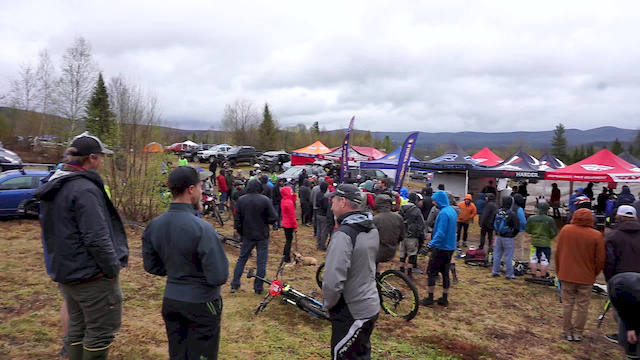 For the second time in as many starts, racers were treated to a new venue, and again the race sold out with more than 200 racers participating. The race was undoubtedly the most physically demanding enduro in Eastern States Cup history with long stages and taxing transfers. Victory Hill isn't exactly in the middle of nowhere, its just next to the middle of nowhere. The venue is not named for a desired race result but rather for the remote Northeast Kingdom town of Victory where it is located. 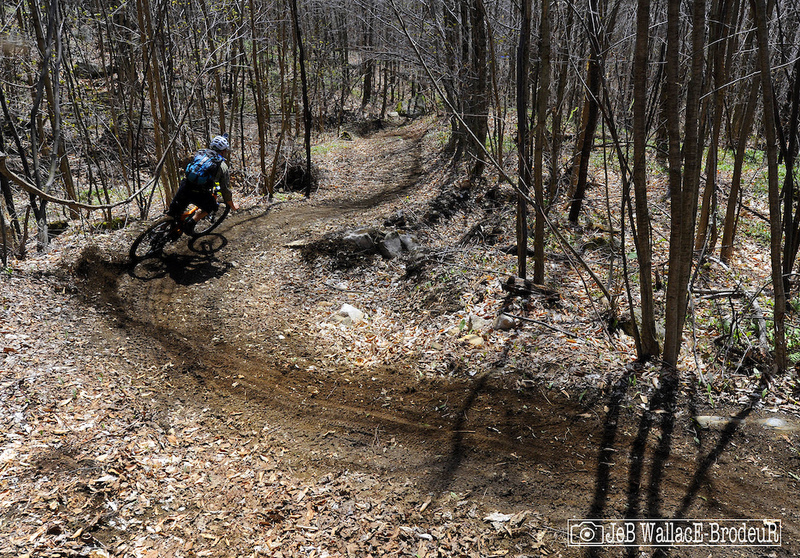 Only a few miles, as the crow flies, from the mountain biking mecca of Kingdom Trails in East Burke, Victory Hill has a raw wilderness vibe that is belies its proximity to the buffed network on the other side of the mountain. Found on a dead end dirt road with no running water or electricity, this was not a walk in the park. The trail network at Victory Hill has slowly been taking shape for many years now. The property belongs to John McGill (pictured) and Laury Saligman who purchased more than 900 acres of formerly logged land when it came up for sale. 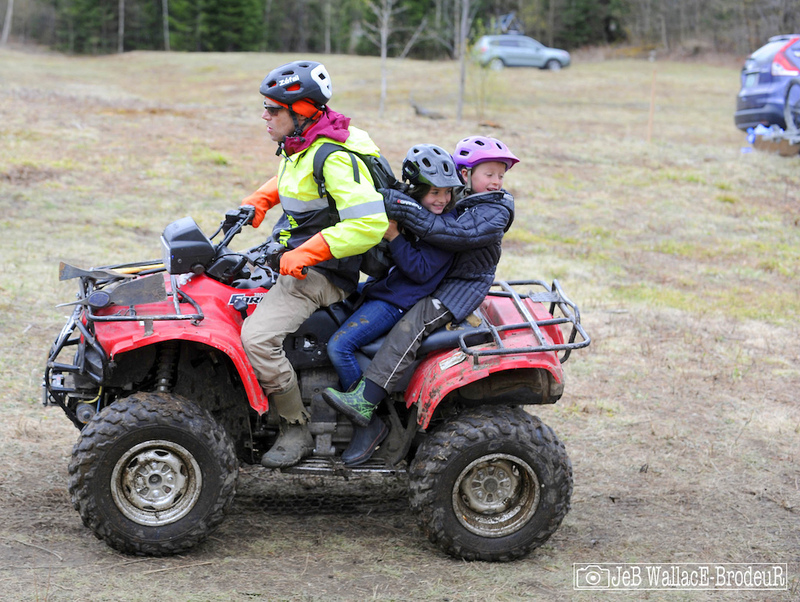 The couple's plan is to get a conservation easement on the land and eventually grow the network so that it connects to Kingdom Trails. 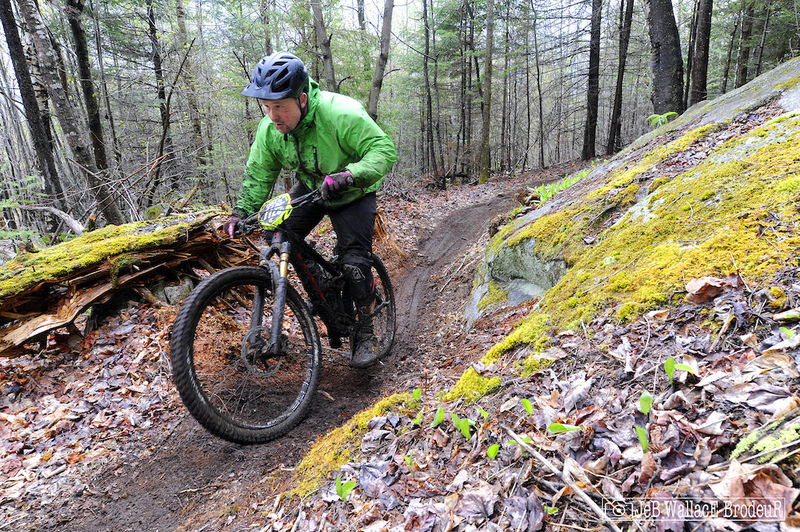 McGill started the trail building efforts about five years ago and has partnered with Kingdom Trails for the annual Circumburke event which starts and ends in East Burke and passes through the system. McGill enlisted local trail building legend Knight Ide to help with layout and building, much of which took place just last fall. The event featured four long stages and was more pedally than any event the ESC has ever hosted. 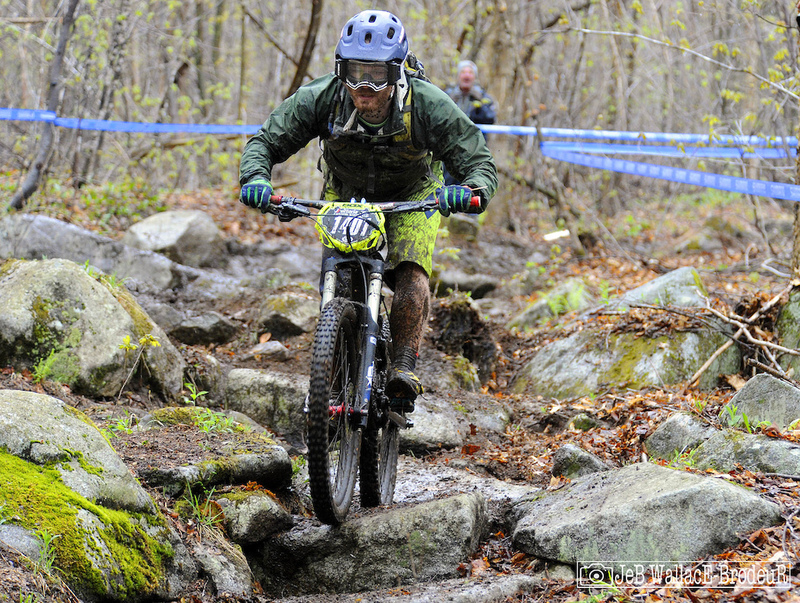 Any one of the four stages would have been the longest of the day at a typical ESC enduro. 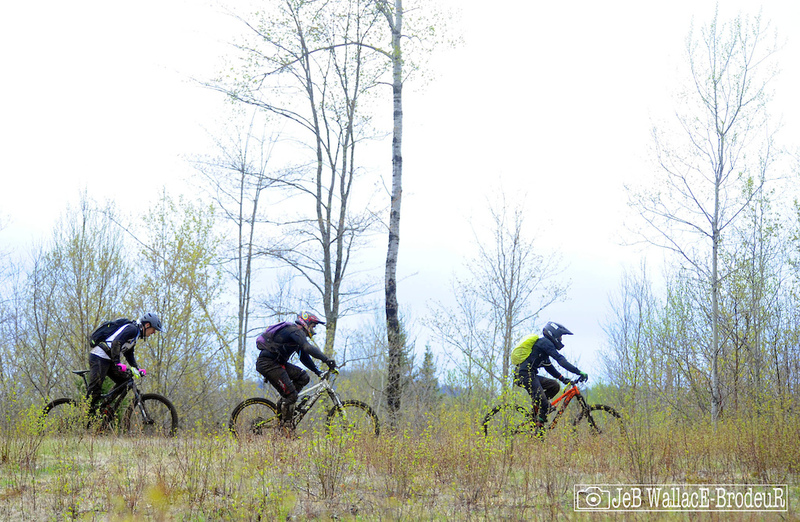 After a half hour or so pedal up the hill, Stage One romped through new growth in an area that had been heavily logged. Ryan St. Lawrence, racing for Team Granite, sped past the remains of former forest flora, during practice on Saturday. St. Lawrence took 2nd in the 30-39 class on race day. Paralleling the transfer road, the stage took a long sinuous ramble through saplings and green patches of trout lilies. 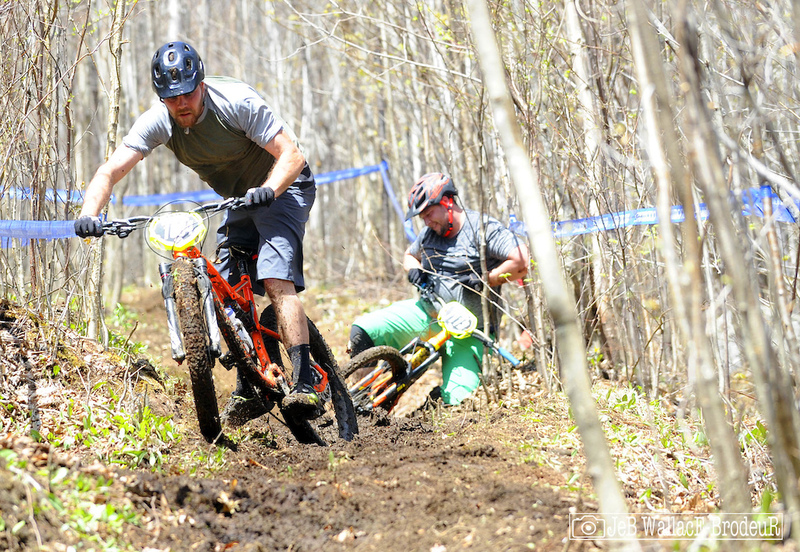 Richard Hersey railed it through the flowy berms on Sunday. Lower on the stage, racers encountered the first mud hole of many to come. Pro racer Sabin Rossi, riding for The Collective and Competitive Edge, got in deep while charging to a top-ten finish. After climbing back up the hill, racers took on Stage Two which was the driest of the day and one of the most fun with endless swooping turns, rollers and poppy features. Glen Brimmer appreciated the playful elements on Stage Two and raced to a 6th-place finish in his class on Sunday. Stage Three started with some of the flowiest turns on the mountain. The cruise was short-lived though. Following an old logging road on a long traverse, the trail became more of a river with ground water pouring through the rocky off-camber line. After testing the options, nearly every racer, including pro Matt Sebas, riding for Yeti Cycles and Maxis, took the water line on the right side of the trail. 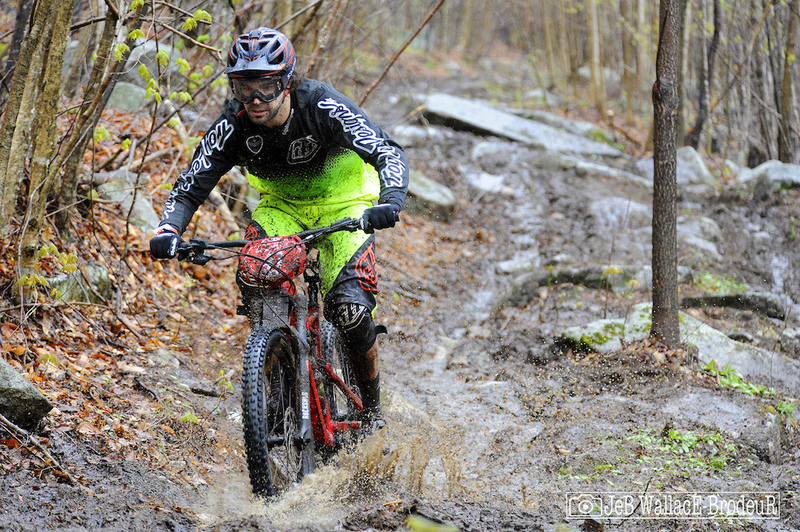 It got pretty deep in spots and racers, like pro Ian Herchenroder, just had to keep the wheels churning to get through it. 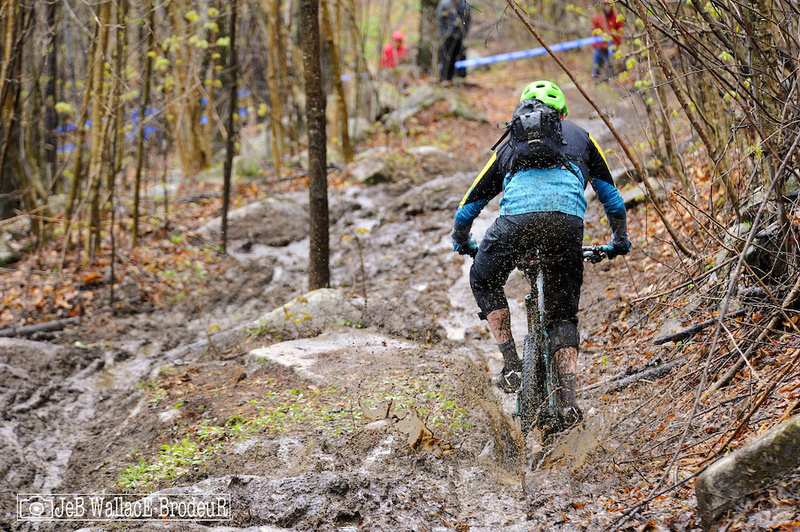 Immediately after being released from the torrent, riders faced the steepest and rockiest section of the day with a mud covered rock garden plunging down the fall line. Many riders came out of the saddle trying to navigate the greasy minefield. Zeke Brynin, racing in the gigantic 19-29 class for Bicycle World, had one of the more acrobatic dismounts of the day, executing a perfect barrel roll over a boulder. Stage Four was a doozey. In addition to the now-familiar transfer, riders faced an arduous hike-a-bike to get to the top of the stage. The steep initial pitch of the stage was the undoing of countless riders on the day. 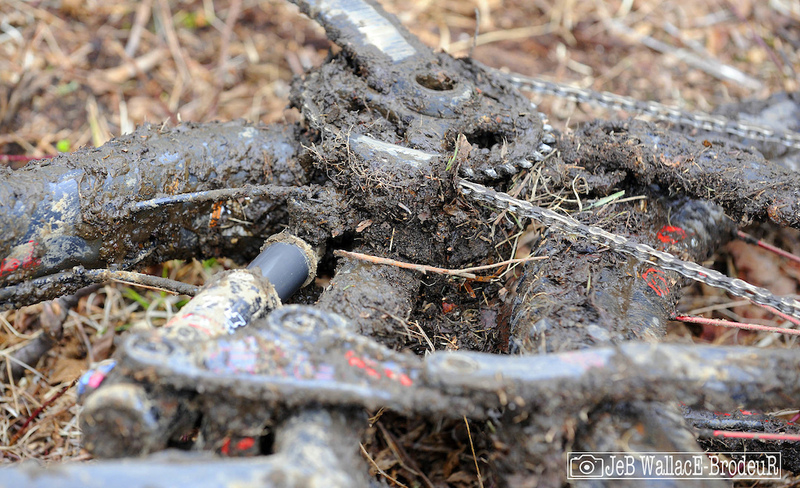 With steady rains on Saturday night, the track became a lava flow of brown goop that many racers found nearly unrideable. Pro Matt Timmerman, riding for Cannonade, used some yoga moves to stay upright. 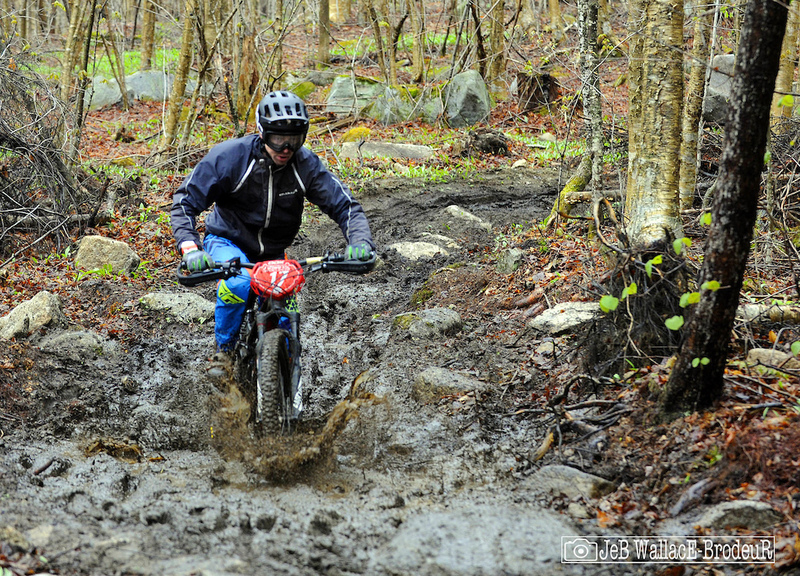 The peanut butter slip and slide was a great place for riders to work on getting their mud whips sideways. At more than seven minutes for the fastest pros and more than ten for the slower riders, Stage Four was a true test of stamina and grit, especially at the end of a long race day. Emmett Avery, riding for Chuck's Bikes, laid down one of the fastest runs of the day, winning the 18 and under class by a healthy margin. Avery's time would have placed him 6th for the day in the pro men's field. The bottom of Stage Four was built by Knight Ide and milked the terrain for all its worth. Rob Walker, owner of Claremont Cycles and a big racing supporter, followed the line through natural features. The stage was constantly engaging with a wide variety natural playground elements. The sinuous lower section rode a lot like some of the offerings at Kingdom Trails with flowy lines through the low angle forest. Super fast Tommy Pierce, racing for Cycle Lodge, Fullsquish and Bicycle Therapy, treated the section like a dual slalom course. To punctuate the stage, a couple big features marked the end of the track for racer’s who felt like logging some airtime. 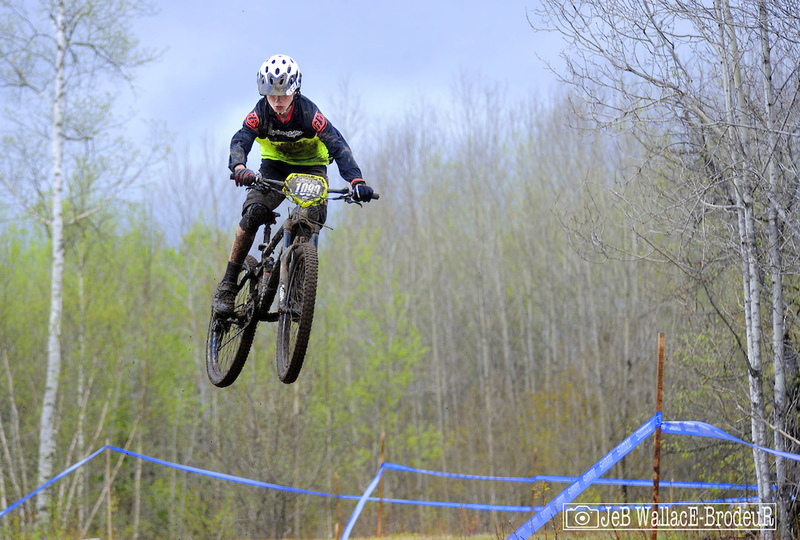 Local junior Ethan Mosedale, racing for Ideride, sent the final step down deep. A wooden ramp was placed in the final autobahn charge to the timing box at the end of the stage. Not sure if it was faster to hit the ramp, but it was irresistible for the junior riders. 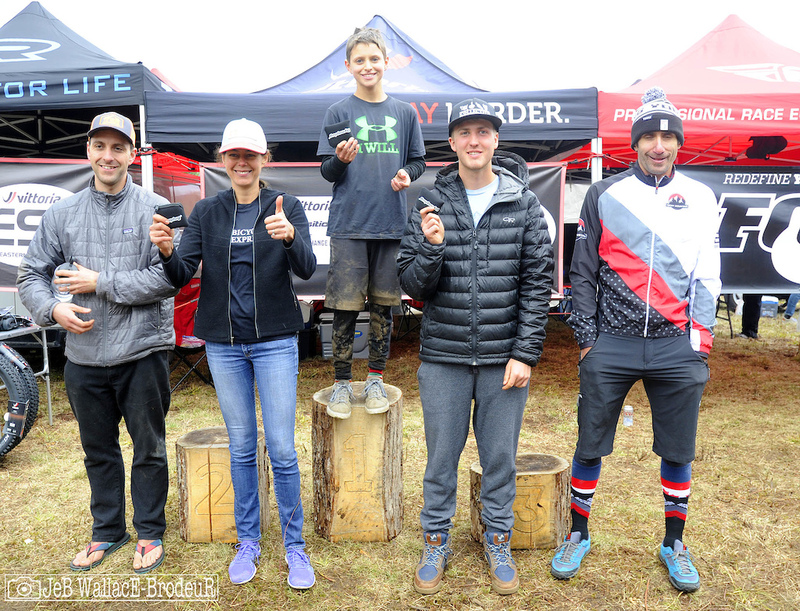 Knight Ide's son, Damien, launched it into the stratosphere on his way to a 4th-place finish in the Clif Kids 14 and under category. Before we get to race day results, lets pause for a bike check. For this race I chose trail builder Knight Ide, for obvious reasons. He's also got a pretty unusual build. Fortunately I caught him before he headed up the hill on Sunday and coated his steed in mud. Back to the race. As I mentioned, it rained steadily on Saturday night and for much of the day Sunday. 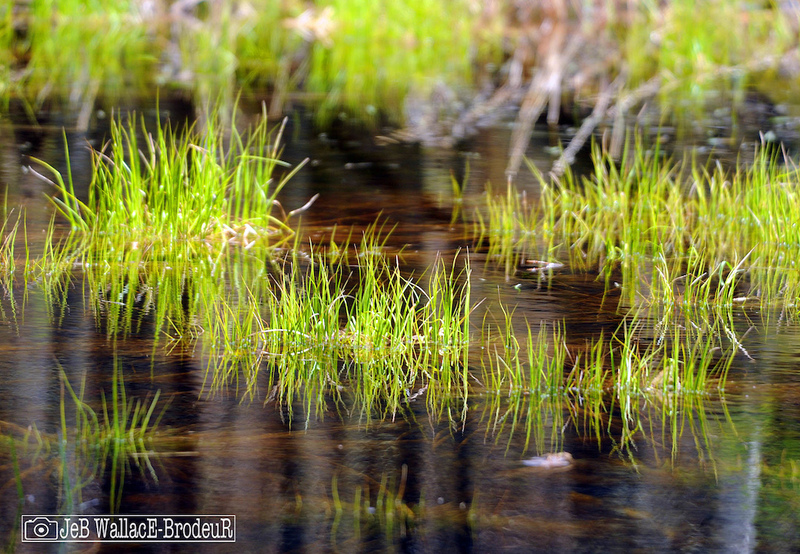 The cold front that swept the rain into the area chased the black flies away but left the ground saturated. 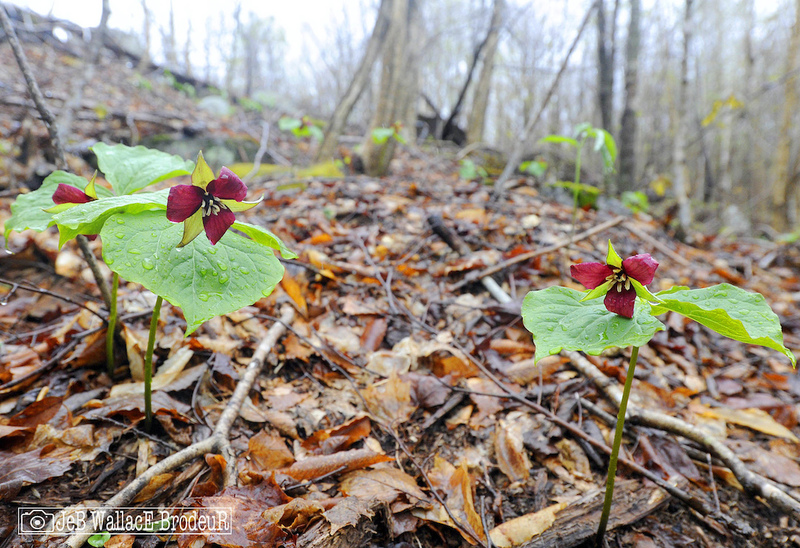 The blooming trillium liked the rain, the racers maybe not so much. 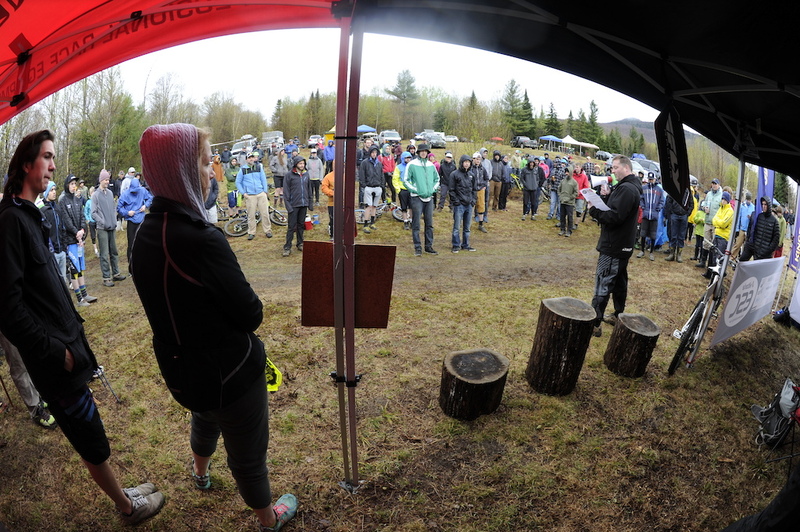 Despite the wet, windy and raw weather, an undeterred crowd gathered in the meadow below the flanks of Victory Hill for last-minute instructions from race director Steve Battaglini on Sunday morning. 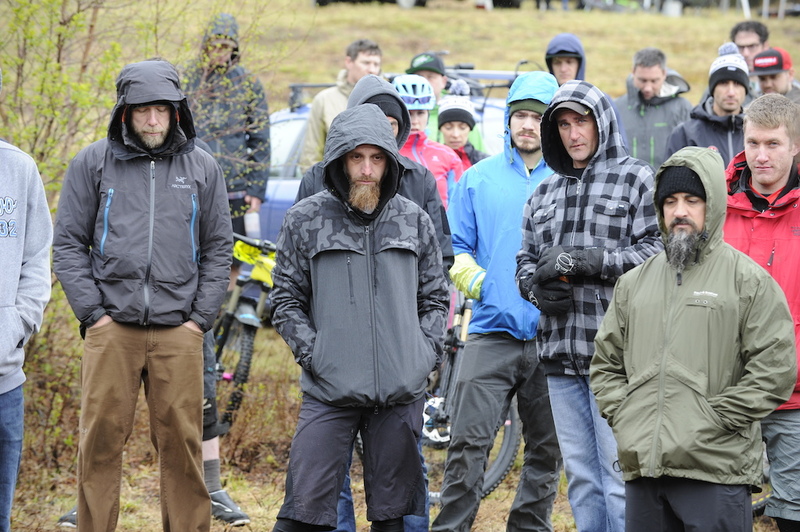 During the racer meeting a moment of silence was observed to honor the passing of downhill racing legend Stevie Smith, a great loss for our sport. Under lead gray skies, racers headed up the mountain. Mud was the theme of the day. A typical frame at the end of racing. At least we know the shock's dust wipe was working. The winners of the FOX DOSS Seatpost Climber's Challenge. 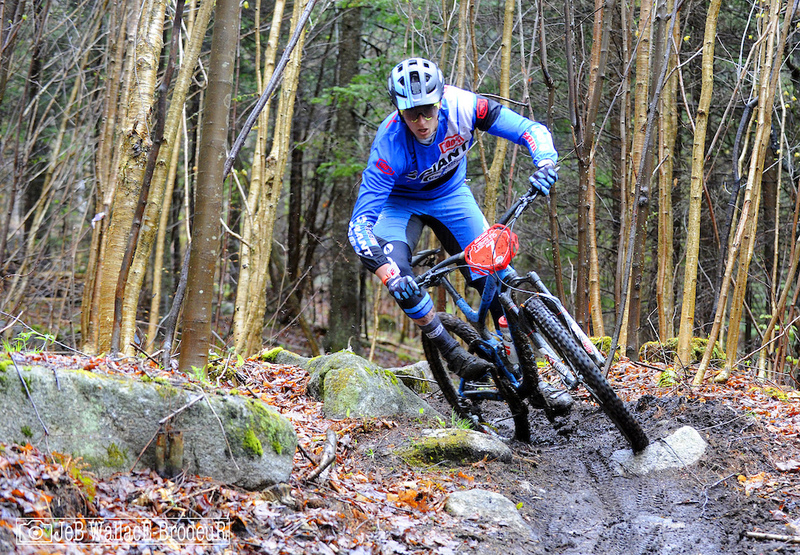 Taking the win for the pro men was perennial podium threat Seamus Powell, racing for Giant Factory Off Road Racing. Powell won Stages One and Three and had a 10-second cushion entering the final leg but gave back almost all of it after struggling in the mud at the top of Stage Four and eked out the win by the slimmest, one-second margin. Said Powell: "I was feeling a little wonky on Stage Four. I didn't bring enough food with me and I got to the top and was feeling a little blurry, definitely the hardest of the stages. I got balled up three or four times and got flustered. I gave it a little too much after that and lost a little flow and was making silly mistakes. I managed to hold it together toward the end and pull back some time from my mistakes." Powell has been working hard in the off season dialing in his fitness with power meters from Stages Cycling. As for the new Victory Hill venue, Powell was impressed. "The tracks were really awesome! Definitely physical because of the muddy conditions that sapped your speed and power. 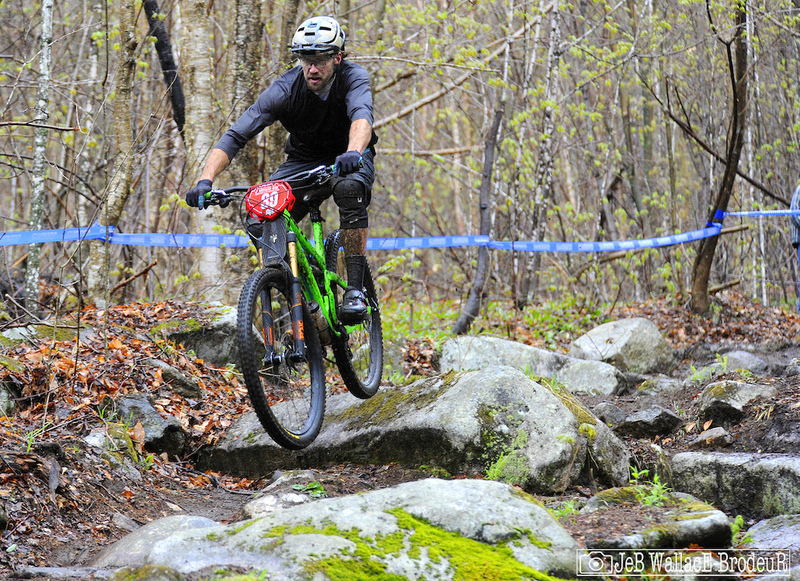 The stages provided the perfect example of true East coast enduro racing: Long stages that blur the lines of skill, fitness and finesse!" 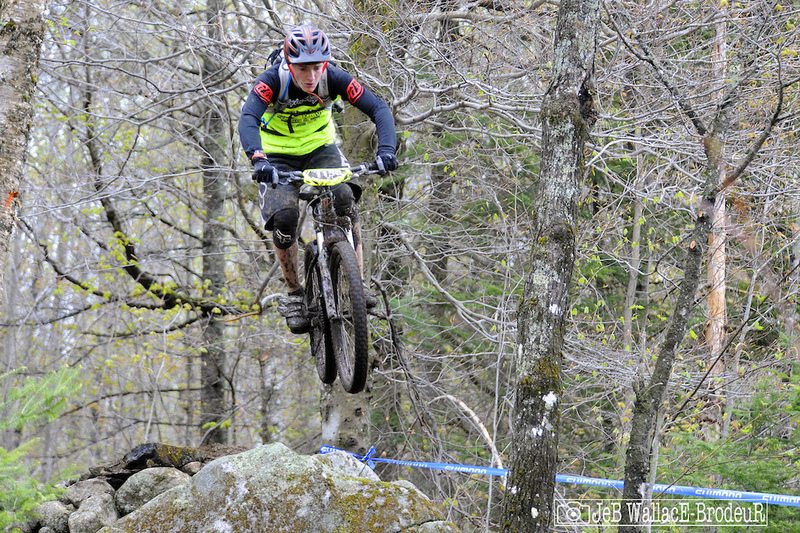 Powell plans to race a mix of ESC, Big Mountain and EWS enduro events this season. In the runner up spot was Peter Ostroski, visiting his New Hampshire roots from his current home in Alaska. Ostroski, racing on the Rocky Mountain Urge Rally Team, has been logging some frequent flyer miles in the enduro world, competing in nine Enduro World Series events in the past two years. Ostroski really put the hammer down on Stage Four, taking the segment win by nine seconds. Ostroski grew up in North Conway but is currently a full-time alpine ski coach in Girdwood, Alaska. With all his international experience, Ostroski has some unique perspective on Enduro venues. "I thought Victory Hill was a cool zone with lots of potential. It's always interesting racing in new places and seeing promoters interpretation of Enduro. I like that the sport gives freedom to each organizer and venue. Victory Hill is set up very similar to the EWS venue in Ireland, with one main transfer climb and stages that descend off of different aspects of the mountain. With a little more gravity oriented stages Victory has the potential to be a staple high-caliber event." 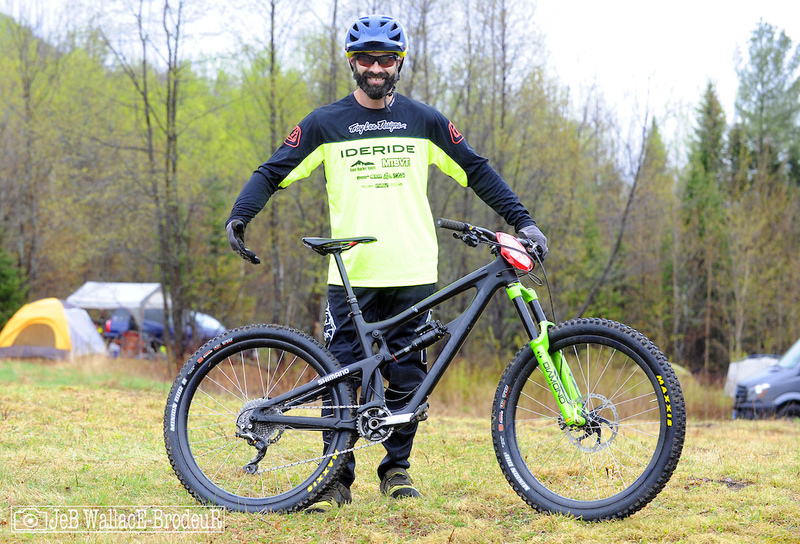 This was likely Ostroski's only ESC start of the season as he heads back west to race North American Enduro Tour races and Enduro World Series events in Italy, Aspen, and Whistler. In the third spot was Jason Memmelaar, racing for Yeti Cycles. 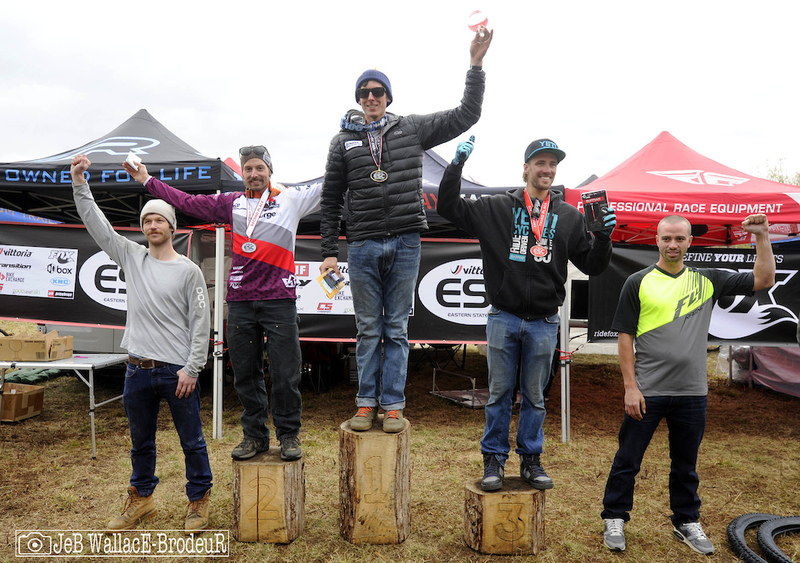 Memmelaar won the the first Vittoria ESC enduro of the year at Diamond Hill, RI a few weeks back and appears poised for a season-long battle with Powell for the top step on the podium. Memmelaar enjoyed his time at Victory Hill but didn't feel it played perfectly into his strengths. 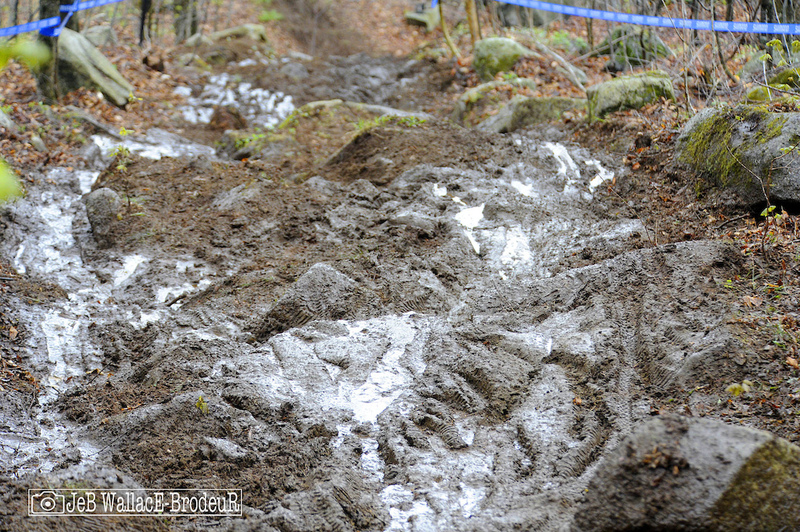 "This race was fun for the first ten guys, after that the trails were shot as they were so slick and rutted. I could have used a bit more downhill but that's because I like gravity! I'm about five to eight pounds lighter then last year and I'm on a SB4.5 29er, so for me being 11 seconds down from those two guys on these trails is an accomplishment for me. I still went in thinking I was going to win. They both showed up to ride this weekend and flat out beat me." Despite cramping up a bit on Stage Four, Memmelaar said he wished there was a fifth stage (a sentiment not shared by many). Memmelaar plans to race the majority of the ESC series and is on the waiting list for the Aspen EWS this summer. On the women’s side, veteran downhill racer Dawn Bourque, who has only raced twice in the past six years, won three stages and took home the victory by a convincing nine-second margin. 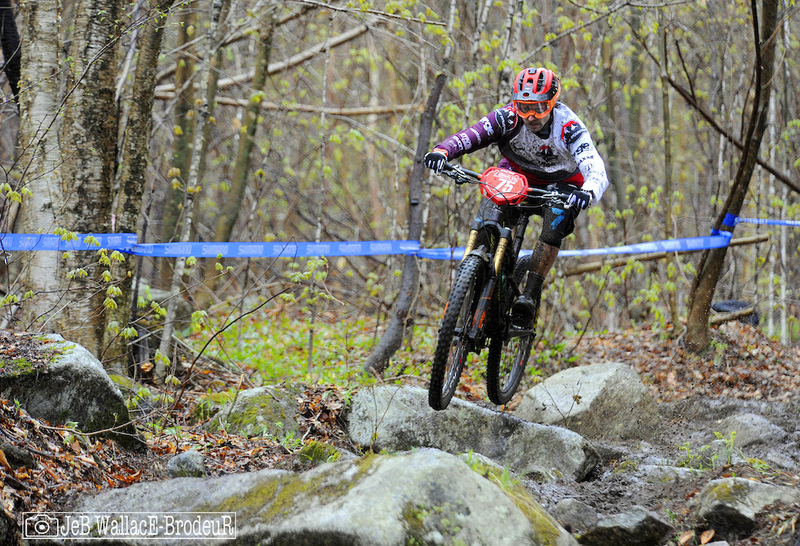 Bourque raced downhill for about 20 years and after a few years away from the race scene its great to see her back on the bike. 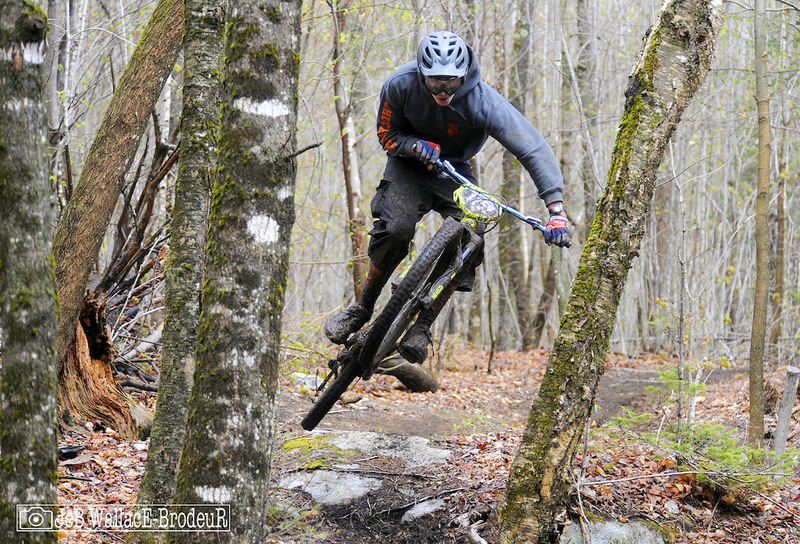 Bourque enjoyed the venue: "The trails at Victory Hill were so much fun to ride. But to race it was extremely tough. The long sprints with lots of mud was very physically demanding. It was cool that it was not at a ski area so you had to pedal to practice. To me that seems more what an enduro is about. It's good to see a few of these types of venues mixed in with the traditional ski area events." 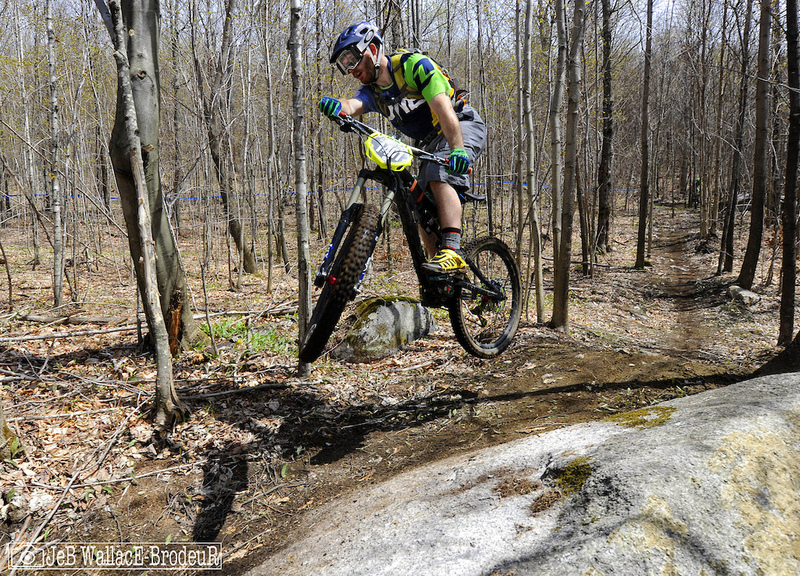 Bourque works as a bartender at Waterville Valley in New Hampshire so its hard for her to get away on weekends to race but she is hoping to make to a few more enduros this season. 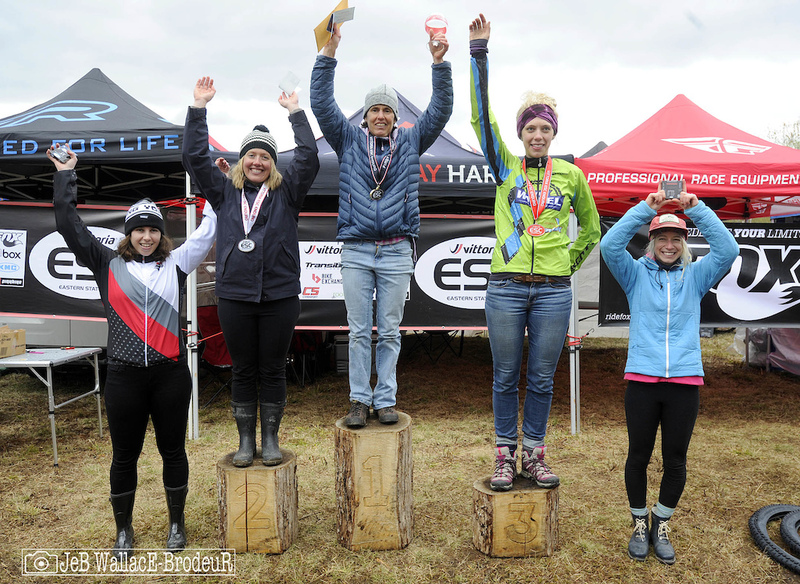 On the second step was reigning Vittoria ESC enduro overall champion Lauren Petersen, racing for CFM Cycles, Intense Cycles and Honey Stinger. Petersen had not missed the podium for a remarkable 22-race stretch until a bad crash at Diamond Hill broke her streak in April. With her runner-up finish at Victory Hill, she appears to be healed up and ready to start a new streak. Like everyone, the conditions were top of mind for Petersen: "The race conditions were beyond tough with the deep mud and a ton of pedaling. I give huge props to everyone who finished this weekend – and especially to anyone who got through Stage Four without crashing (though I don’t think there were too many racers who managed that). A co-worker of mine is complaining that he's all torn up and hurting so bad from hitting some golf balls around this weekend and it just makes me laugh as I don't think he would have lasted two minutes on the race course at Victory Hill." 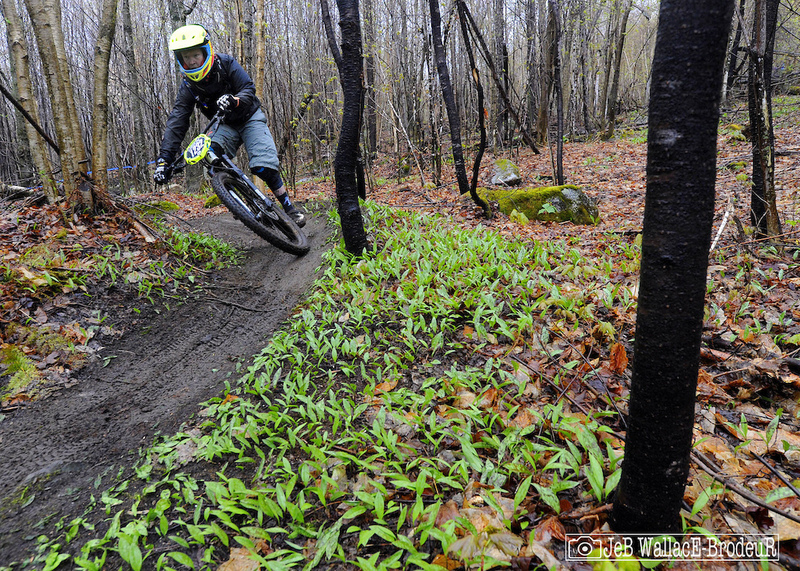 The women's enduro field has been exploding of late and Petersen is excited to see the numbers growing. "I couldn’t believe there were 17 competitors this weekend and everyone has really stepped up their game. It’s become far more competitive but the dynamics between all us girls has remained the same in that we still band together to just have a great time and cheer each other on.To race against Dawn Bourque is amazing as she always pushes me to go harder. A big congrats to her on the win and there is no one I’d rather take second place to!" ESC newcomer Sarah Lynch took third place, just 12 seconds off the pace. Lynch, a university student from Waterloo, Ontario, has worked her way up through the XC ranks but made the decision to sell her XC bike over the winter and get a bigger, more aggressive bike. 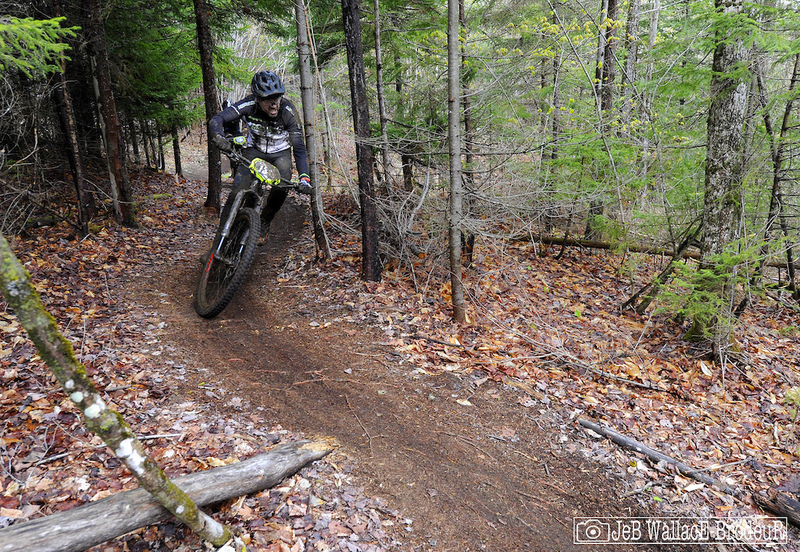 The Victory Hill Enduro was her first race of the season. 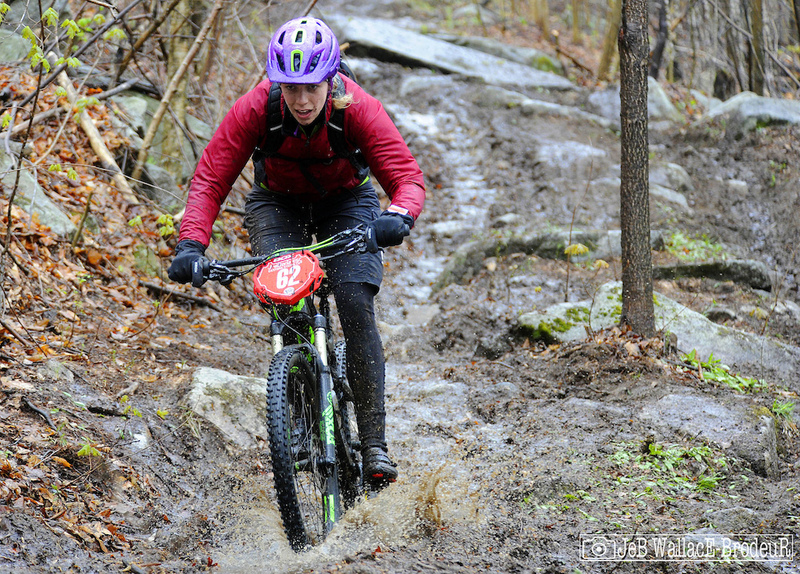 "The cold, wet and muddy race day was a completely new experience. I cant say I've ever gone full speed down a 'muddy waterfall' before! I was very thankful to have purchased mud tires the day I left for the race. The Eastern States Cup definitely has one of the most welcoming environments I've ever been to, and I made so many new riding buddies on just my first day on the track. After the race I was ecstatic to learn that I had finished third and probably checked the results screen nine or ten times to make sure." Lynch plans to race more ESC events this summer with her eye on a possible EWS start down the road. At the end of the day Sunday, the sun made a brief but welcome appearance. Lets hope its a harbinger of perfect racing weather this season. 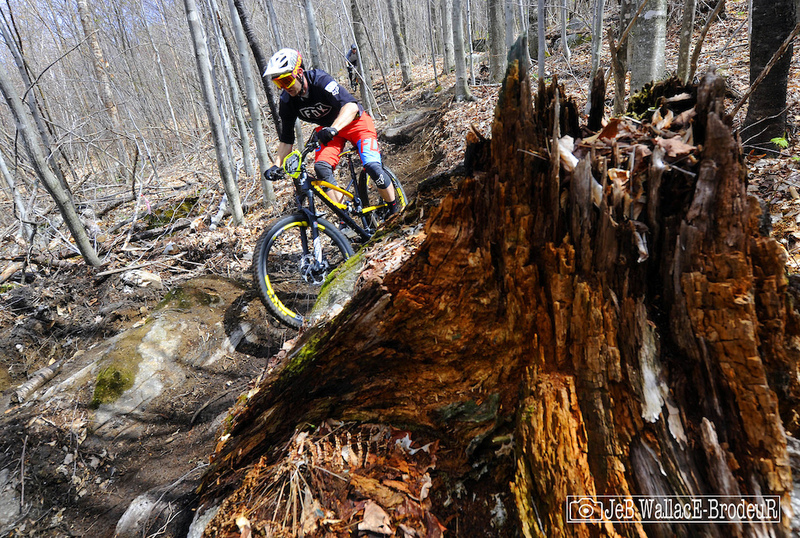 The next Vittoria ESC enduro will be June 5th at Blue Mountain in Palmerston, PA. Don't miss it! 3 hours and half a bottle of Simple Green later, I can finally recognize my bike again! Still no brakes, though. I think the pads are toast. That was outrageously fun--rain, cold, mud, and ticks notwithstanding. Nothing makes you feel like a hero like (pedal)power-sliding around greasy corners at .05 mph! Great work by all the athletes. It was a tough course and trying conditions. At the end there were so many smiles and stories and that's what it's all about ! By far the hardest Race I have ridden! Thanks to all the people that help set this event up and volunteered their time. A huge shout out to the land owners as well. 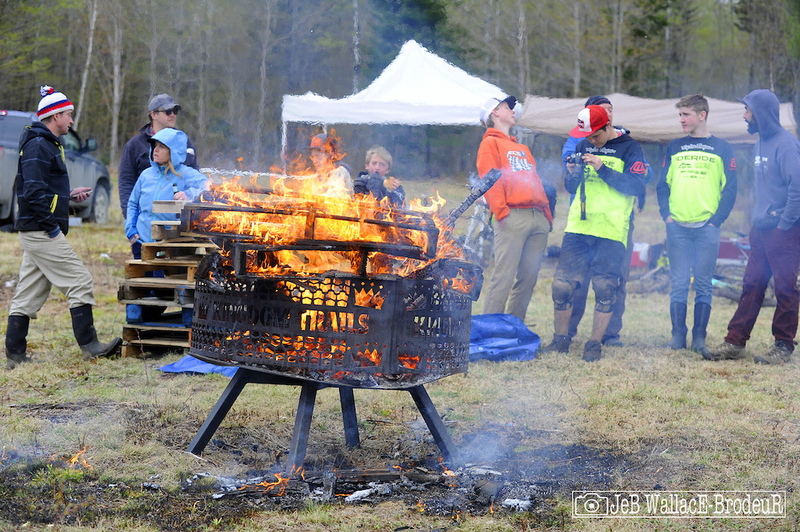 not many events these days let you take full ownership of their facilities and let you have things like fires. Had a blast and cant wait to go back!! 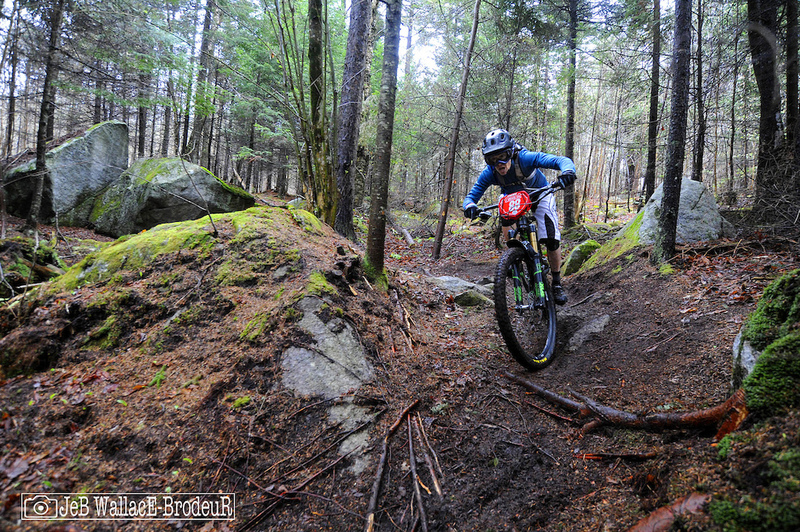 The conditions certainly were demanding but in spite of the cold, wet,sloppy trails, my son and I had a blast. We have been doing enduro's for the past 6 months and are completely into the format. ESC puts on first class events and the timing crew is top notch. 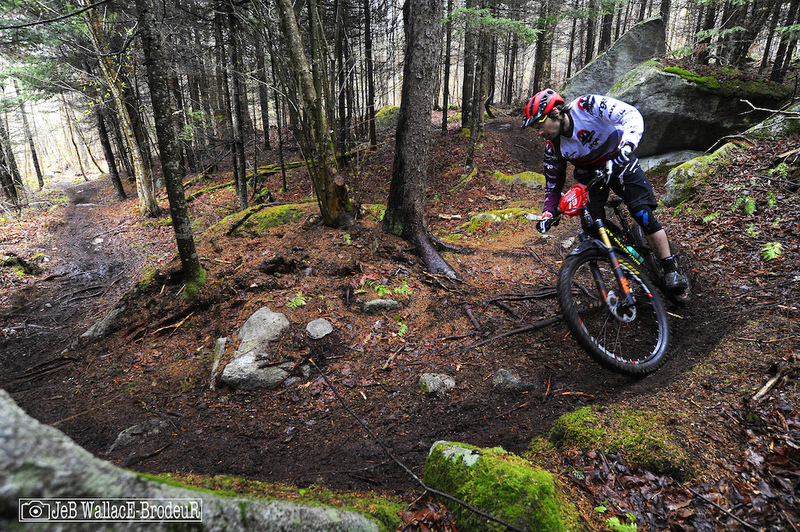 The NE enduro scene sure has it good right now. Brilliant idea ! We could start in October then fit in the 10 series races, 3 races we manage in another series and 3-4 we manage for other promoters. Racers would be so happy racing straight thru March, especially because its so dry and warm then. hmmmmmm indeed. @Eastern-States-Cup: how about start in June and go til then...duh. @Eastern-States-Cup: wow, how much more passive agressive can you be? Great showing old chap! @wiscodh: ahh you are right. I guess when someone is so far out of bounds I lose my patience. Honestly anyone can do a little research before making a completely wrong criticizing comment. June, July, August and September are the rainiest months in Vermont, followed by May, October, then November. @preach At the top of stage four I was one of the last riders to take the decent which I was honestly a little terrified. However one of the riders up there with me made a point that normally no one would ride in condotions like these common sense tell you no. And parks and trail centers would have closed the trial. So with that in mind amidst the rain and mud we rode trails in conditions that we might never see again which to me is awesome so what if it's cold or rainy were mountain bikers is this what we do. I wouldn't have changed anything about the race I was smiling ear to ear at the bottom of every stage and I'm still smiling as I clean my bike. @Eastern-States-Cup Thank you for such a great event. @Dynex: very much exactly what you said. 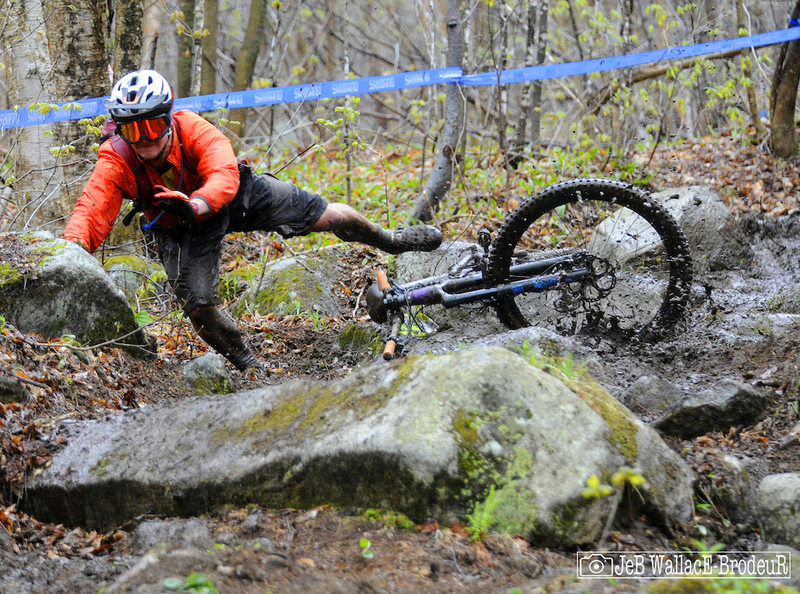 Ive never ridden conditions like that and never would outside of a race. It was a completely unique experience and so much fun. 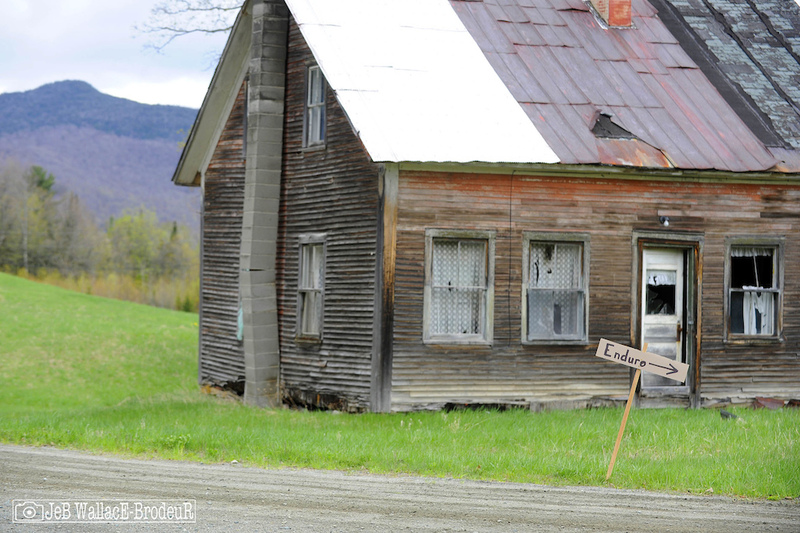 @Eastern-States-Cup: A race in North East Kingdom Vermont in May was bound to be a crapshoot. Lucky this year was a low snow year or this could've been a fat bike race (with spikes). Props to all the racers and the organizers, but if possible, schedule the more southern races for the early season. New Jersey and northern most Vermont have very different climates, particularly this time of year. @Eastern-States-Cup: Maybe so, but the soils are almost always still saturated in May (from snowmelt), making any additional rain a mudbath. Once the initial drying phase happens (usually by July 4th, roughly), then the rains tend to have less of an impact. I signed up for this race hoping maybe the geology is like Darling Hill: sandy with excellent drainage. Nope. Had a blast during practice on Saturday though, and will definitely be back up to Victory in a month or so. The tracks should be even more technical now...ridden in indeed. The Triple Crown series is in late September and October, it rained at everyone of those events. When someone figures out the weather for the northeast let us know. I see a guy with an xc fork in picture that did well. Did not do this race because i heard you can win in a hardtail 29er. Seems as though ESC is trending towards more pedally events. 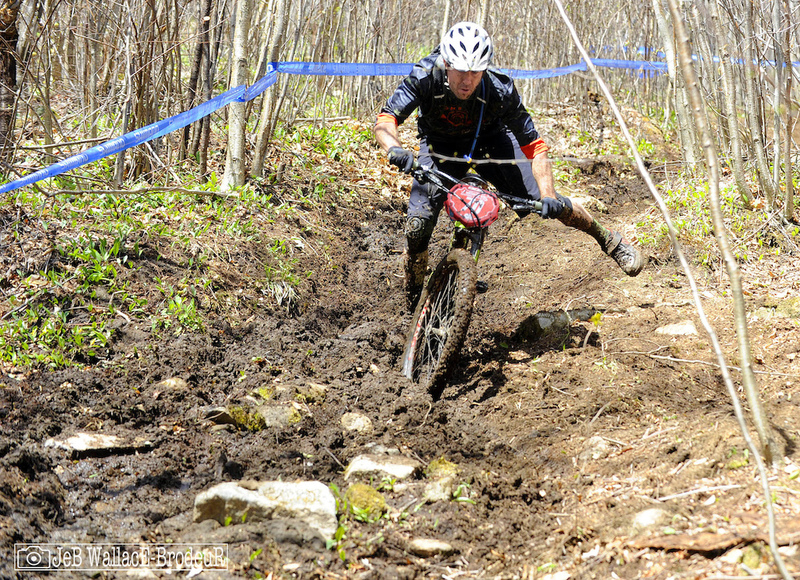 Will be at blue mtn hopefully they will offer up the fast,rough,steep courses of the past. Hopefully platte, blue and attitash will be on par with courses in the past. Those were always the roughest and tested bike handling skills not just ability to climb. Just mixing it up at new venues. Victory is primarily trail riding, minimal DH stuff, there will still be plenty of high speed fun to be had. 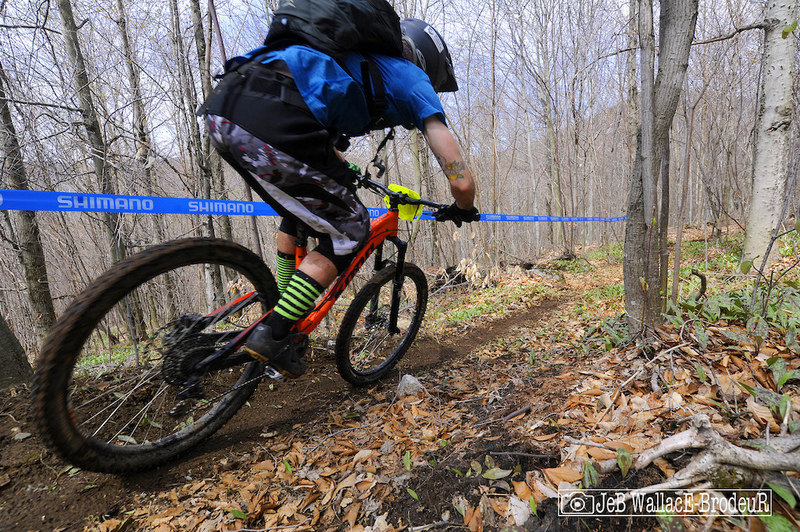 Blue is an amazing venue, the enduro there was one of my favorites from last year, its very fun, fast, and plenty of rough stuff, but enough pedaling to make you work for it. You will be stoked on Blue for sure. 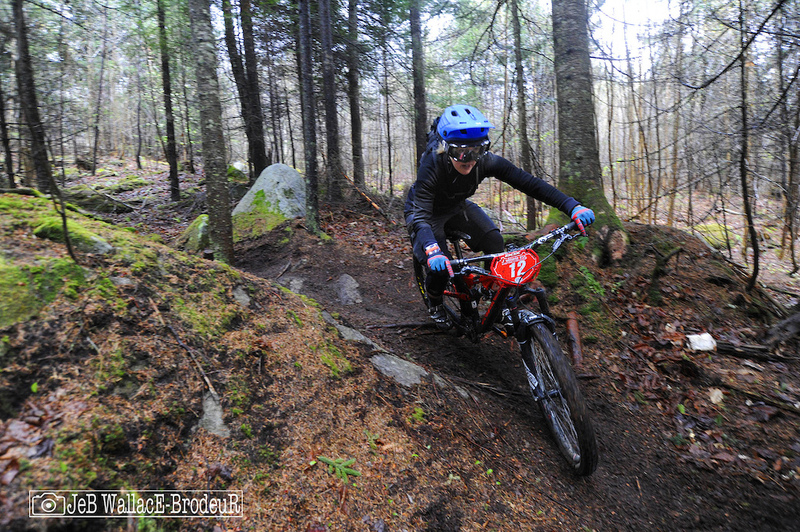 I loved blue mountain enduro last year as did many. I heard they put in new enduro trail. If similar to the last years race will be awesome. What was up with the ticks, man!? It was practically frickin' snowing, and the damn things were everywhere! @ryetoast: Why I'll never visit East Coast again. Riding at Ninham in upstate NY I got Lyme, babisiosis (like malaria) and ehrlichiosis (like lyme); at once. Crippled and nearly killed me. Take them seriously! 5 years later I still haven't totally recovered. Really awesome trails though, lots of rocks and roots, big awesome granite rollers, killer terrain! 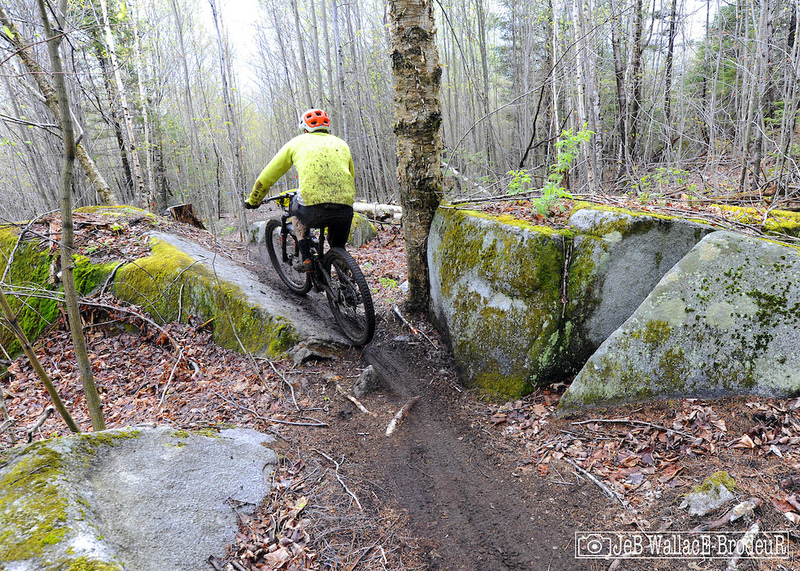 Lot of great trails in the Northeast. Tough weekend but had a blast! Thanks for showing us some new trails, definitely gonna be headed here later this summer! One heck of an event! Thanks ECS team. So much mud! But trails were amazing, challenging and full of fun. I'm coming back when they're dry! Yeah, I watched a the crash reel from A Slice of British Pie like 3 times the night before the race, just to psychologically prepare myself. i don't see what's so unusual about that nomad build. is it because nobody runs DVO? This was a challenging event! Then go home! Too many maf*ckers in Colorado right now anyway!